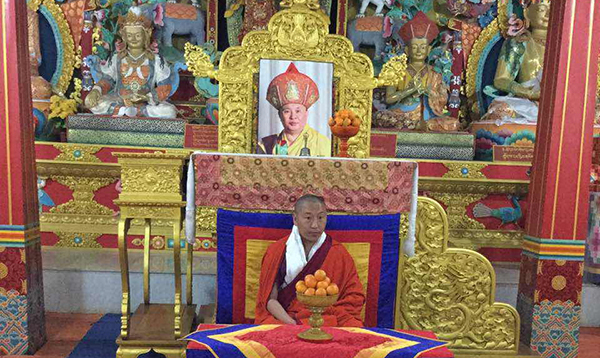 His Holiness the Je Khenpo appointed Lam Pema Gyeltshen as the new Rigsum Goenpa Lam yesterday. His Holiness awarded Tashi Lekhdhar, a ceremonial scarf, to Lam Pema at Autsho in Lhuentse. The new appointee is from Boomdeling Gewog in Trashi Yangtse. He started his monastic education at the age of 11 in Trashi Yangste Dratshang. After that, his commitment to Buddhism continued at Leyshey Jungney Shedra in Punakha. Prior to assuming his current post, Lam Pema served as Dro-dhen Lam in Trashi Yangtse. He is the 18th Lam of Rigsum Goenpa which is located on a ridge overlooking the Boomdeling Valley.